Second edition paperback includes a new chapter & 100s of new photos. Don't miss his many make-up and beauty secrets, fashion advice, and celebrity enounters and his world famous lawsuit with Rivers and how they became friends again and also how he became Las Vegas's longest running headliner and queen of the strip. You've seen the show - now read the book! This 16-page foldout program book features the entire cast in and out of makeup, plus candid photos of celebrity guests! Can't make it to the show? â€” see it yourself! See the famous Divas Las Vegas show in the privacy of your own home on DVD. Whether you have seen it before or viewing it for your first time, this 90 min. DVD is a MUST HAVE! Perfect to hang on any wall... or ceiling! Showcasing some of Frank's most extravagant looks over the past twenty years. Each poster personally autographed. 12â€� custom designed â€œBarbieâ€� inspired doll. The gown is interchangeable with other Barbie fashions. Good for ages 3 and up. Donâ€™t worry this doll is NOT Anatomically correct! Put the diva on your back! When the temperatures drop, enjoy this 100% cotton hooded sweatshirt. Always in style, like Frank Marino himself, this 100% cotton hooded sweatshirt is the perfect accessory to throw on over any outfit. Limited Supply so get yours now as they will be soon be gone! The long awaited second autobiography continues the trials and tribulations of Las Vegasâ€™s longest running headliner. 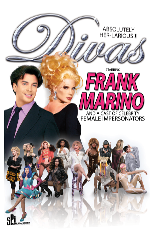 From the passing of famed comedian Joan Rivers to the birth of his â€œShowboy Mansionâ€� follow Frank Marino through his journey to remain the Queen of the Las Vegas Strip.